I love this idea! It’s similar to the brand jamming idea that I shared in the post Fight the Power: Children and Adolescents as Consumer Activists , but instead of making up our own contest, we participate in the one that Candie’s itself has designed! Please post any that you submit to Dr. Jennifer Shewmaker’s Operation Transformation Facebook page too! 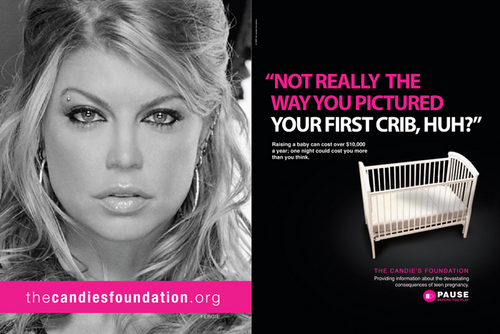 Let’s let Candie’s hear our voices speaking very clearly about their sexualized ad campaigns! One thing that I love about The SPARK Summit was that it was very specifically designed to “engage girls as part of the solution rather than to protect them from the problem.” Through workshops, programs, coalitions, and so forth, SPARK promotes grass root efforts. SPARK is a great, positive organization that provides proactive ideas to get young people involved in sharing their authentic voices. Check them out! How do you feel about me sharing this on BeautyRedefind.net? I love this little, fun, and hopefully powerful opportunity for activism! And the Spark Movement sounds fantastic! Let’s get as many of these anti-sexualization ads submitted as possible! Of course, share away!! I loved the ad you made, it was jarring. This is so great! Thank you Jennifer. I just shared a link to your blog on the Hardy Girls Healthy Women Training Institute facebook page, http://www.facebook.com/hardygirlstraining. We are definitely in the same loop! This entry was posted on May 4, 2011 by Jennifer Shewmaker in Acting, Cooperating, For Teens and Tweens, What's out There That's Good and tagged identity, media messages and children, parenting advice, Sexualization, sexualization of children, sexualization of females in the media, SPARK Summit, what makes a woman powerful, women and power.